Back in the day, purple meant royalty. That's because purple was a super difficult dye to make and only the royals could afford it. Of course, thanks to modern engineering, purple coloring of all shades and varieties is available at your local craft store! You can halve purple shoes, purple hats, purple pants, purple shirts... purple. You get the idea. And if you want to saturate yourself with that much mauve? Well have at it. Violet really is a delightful color. Bright, energetic. Rich. Perfect if you feel like not blending in. Which is exactly what your kid will do if they put on this Child Purple Morphsuit. They won't blend in to anything. They'll stick out like a big sore purple thumb. But hey, if they really like purple that much, then we say go for it. 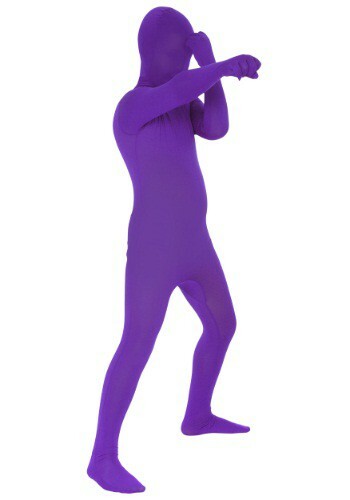 This Child Purple Morphsuit is polyester and spandex and gives full-body coverage. From hands to head to feet, their entire person can be clad in plum (don't worry, there's zippers to escape the violent violet). We're not going to lie. We're not exactly sure why your kid wants to dress up like a lump of lilac, but here it is. If they decide they want to be a violet crayon, purple haze, a plum pedestrian, a lavender ninja, or an amazing amethyst person (or whatever else they can come up with) this morphsuit will have them covered... in purple.